It’s long been said that the best way to know if a man is a good pick to marry is to watch how he treats his mother. If you’ve got boys like I do, I’m sure that, like me, you want to make sure that you’re raising men who love and respect women and who will treat all people with kindness and respect. But if you’re like me, you probably wonder if you’re doing things right and worry that you’re doing things wrong. Boys can be challenging. 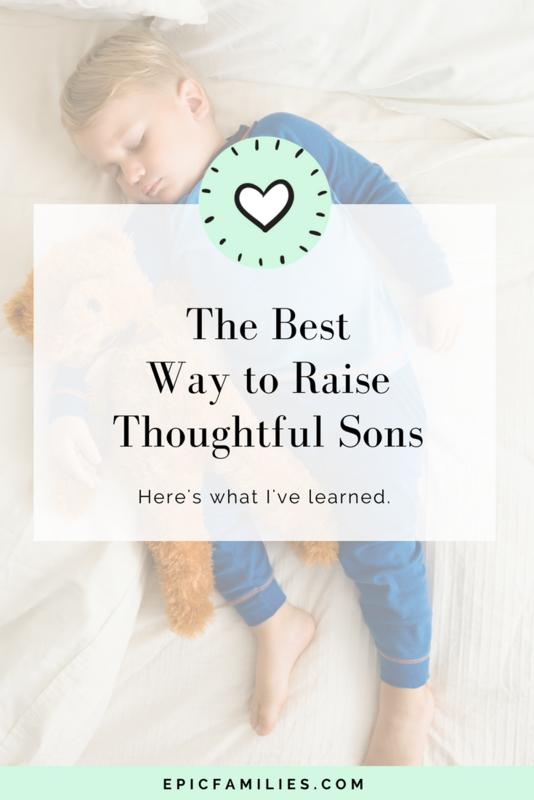 But as moms, when we look beyond the “rats, snails, and puppy dog tails” that boys are made of, we find gentle souls who are biologically programmed to love their mommies and to need extra amounts of nurturing and attention. In many ways, I think girls are much more independent and resilient than boys, and I’ve raised both. As a society, we tend to dote on girls and expect boys to be rough and tumble, and thus more independent. Although all babies and children need our love and affection, boys and girls, boys need extra patience, understanding, and physical affection in my view. That’s proved true for my boys. Here’s what I’ve learned. 1. Boys are not girls. Well, duh! But it’s crazy how we sometimes expect them to behave and have the same attention span as their sisters. My daughter is my oldest; she was content o sit and play with toys or dolls for hours! She would color and occupy herself with little input from me. I could put on a movie, and she’d plop on the sofa and watch it while I got my work done or squeezed in a workout. When my boys came along, it was a total shock! Son #1 seemed to me to be swinging from the chandelier compared to his sister who sat quietly on the sofa watching Barney. 😯 Son #2 made son #1 seem comatose! Once I accepted these bundles of energy for who they were and learned to roll with it, I was a much happier mom! 2. Boys learn differently from girls. Boys frequently master finer skills like reading and handwriting later than girls do. That doesn’t mean they’re not smart and doesn’t mean that they won’t have totally caught up by the age of ten or twelve. I learned this the hard way. Both of my boys were really smart so I tried to rush formal education with son #1. Total disaster (which I worry may have hurt his self confidence). You would think that I learned my lesson and didn’t repeat the same thing with son #2. Wrong!! I made all the same mistakes with him that I had made with my first son. Then, FINALLY, I wised up…and I allowed my boys to learn at their own pace and to move about the room while they learned (legos or other fidgety but quiet activity while listening to stories…hop scotch or ball throwing while learning math), and things went much better! 3. Boys have a shorter attention span than girls and worse hearing. Google it; it’s true. There have been studies over the years that have proven this to be true. When boys don’t respond when you speak or correct them, they really may not have heard you! It’s also normal for boys to move quickly from one activity to another AND to have ants in their pants! When we expect boys to sit quietly for long stretches of time, we do them a disservice. Most boys are just not wired that way. 4. Boys need lots of physical affection. That mom connection is really important! Many boys naturally gravitate towards a love language of physical touch. They thrive on physical contact….a hug, a pat on the head, snuggles in bed when you’re reading them a bedtime story. I have two who nursed until they turned 4 (don’t judge me…it took a trip to Disney World to break this habit!). My third son sometimes slept in my bed or room until he got a girlfriend around the age of 13. So don’t ask me when kids sleep through the night…my answer will be an age way older than you want to hear! 🤷🏼‍♀️ I’m grateful, though, that they wanted to maintain that connection. Boys can be tender loving souls. Love them. Give them physical touch and affirmations. Every day. Communicate with them. Often. Accept them, dirty room, energy, making guns out of anything, and more! It WILL pay off! Just tonight, my baby came home from work with a bouquet of flowers for me. My middle son had already gotten me dinner, as my oldest son did yesterday. They all have good jobs and strong work ethics. They treat girls with respect. They’re thoughtful young men. Can I tell you that my methods are foolproof? Of course not. What I can do is share with you what I’ve done, what I’ve learned, and share with you my results. To find out more, check out my Happy Mom Workshop or Toolkit. With the FREE workshop, you’ll learn the basics of being the mom your kids need now….the Happy Mom Toolkit takes it to the next level, with all the practices I used to ditch overwhelm and be the mom that all my children needed. The proof is in the pudding….or in this case, in the thoughtful men I’ve raised. 💜 You can, too! You’ve got this, mom!